We know what happened back at the end of November (above), and that was written up here and by Novagold at that time. We also know that other Juniors in mining have not done too well, either. Now something interesting has come to light. It was not hidden, and perhaps it's common knowledge. We have 16 of our key suppliers acting as a “Board of Directors” for our Supply Chain Management (SCM) process. Executive management from these 16 suppliers represents Barrick’s core technologies as well as other SCM aspects such as indirect goods and services. Our first meeting was held in September 2004 in coordination with the MINExpo, with breakout sessions utilized to discuss specific issues that our supply base faces in working with Barrick. We have conducted four more meetings since then and have covered a variety of topics including safety best practices; material availability; strategic alliances and local supplier development. One of the keys to the success of this Council is that every member, supplier or Barrick, is able to take away key ideas or strategies that can be utilized at their location. The intent is that the sharing of information is truly a two way path for both Barrick and its key suppliers. In the unique business of gold mining, I would think that the 16 key suppliers to Barrick would easily be the same 16 key suppliers to most everyone else in this business. There is currently no list of who these 16 key suppliers might be. If anyone has a list, send it to EdUCate@GreatRedDragon.com. Because of their recent meetings in 2007, perhaps this may have something to do with the eventual excessive NovaGold (Galore Creek) expense estimates at the end of November 2007. 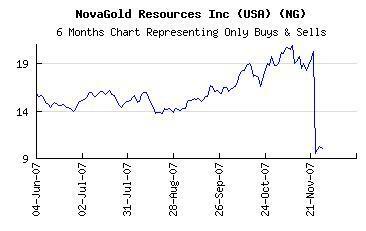 For us not in the know, this would easily cause (and did) panic out of NovaGold's stock. We'll find out when the quarterly reports come out soon. I know it seems like I'm looking under the bed for boogie men, but this NovaGold situation seems a bit too convenient for Barrick. Would any major vendor go against the wishes of their biggest world-wide customer? Especially with the new entries for "Deep Storage" gold. And just what effect could this situation have on other Juniors in mining? We already know how hard it is for Juniors to get development funds from the clubby inter-connections of large banks, as shown by Who Controls Money Center Banks, and Who Controls Investment Banks. So when one sees even more inter-connections by vendors and suppliers, where do Juniors turn? Is this why "Sometimes The Dragon Wins" too often? Well, that's all I can do for now. Again, we'll just have to see how this plays out. And yes, I do have a few shares of Novagold in a retirement account. so that this information stays available for those who will pass this way after you. Thanks!